HERO Report: Wellness Industry Leaders Shockingly Admit that Wellness Is Bad for Morale « They Said What? The question is: how do you help employees spend less and get healthier at the same time? (March 14) This is the first in a series looking at the strengths and weaknesses of the HERO Outcomes Guidelines report, recently released by the Wellness Ignorati. One explanatory note: A comment accused us of insulting the Wellness Ignorati by calling them that. It is not an insult. It describes their brilliant strategy of ignoring facts and encouraging their supporters to do the same. We are very impressed by the disclipline with which they have executed this strategy, and will be providing many examples. However, if they prefer a different moniker to describe their strategy, they should just let us know. We encourage everyone to pick up a copy of this report, the magnum opus of the Wellness Ignorati. Unlike the Ignorati, we are huge advocates of transparency and debate (which they call “bullying”). We want employers to see both sides and decide for themselves what makes sense, rather than spoon-feed them selected misinformation and pretend facts don’t exist. The latter is the strategy of the Wellness Ignorati. Indeed, they earned their moniker by making the decision to consistently ignore inconvenient facts. (This is actually a smart move on their part, given that basically every fact about wellness is inconvenient for them.) For example, they just wrote 87 pages on wellness outcomes measurement without admitting our existence, even though we wrote the only book — an award-winning trade best-seller — on wellness outcomes measurement. Observing the blatant suppression of facts and the loss of credibility that comes with blatantly suppressing facts is just one of the many reasons to read this report. In total, their report provides a far more compelling argument against pry, poke, prod and punish programs than we ourselves have ever made, simply by bungling the (admittedly impossible) argument in favor of them. There is too much fodder for us to deconstruct in one posting, so over the next several weeks we will highlight aspects of this report that we think are especially revealing about the sorry state of the wellness industry. In terms of getting off to a good start, the Ignorati are right up there with Hillary Clinton, with their first self-immolation appearing on Page 10. Remember our mantra from Surviving Workplace Wellness: In wellness, you don’t have to challenge the data to invalidate it. You merely have to read the data. It will invalidate itself. Try telling a CEO that the morale of his workforce and his corporate reputation are “tangential” to his business. We ourselves run a company, and we would not list low morale as a “tangential cost.” Quite the opposite — our entire business depends on our employees’ intrinsic motivation to do the best job they can. If their morale suffers, our profit suffers. That’s why we would never institute a wellness program. The last thing we want to do is impact our morale in order to measure our employees’ body fat. Obviously, it is harder to hire and retain people if you value body fat measurement over job performance, and we are pleased to see the ignorati finally admit this. The fact that employees hate wellness isn’t exactly a news flash. Anytime there is an article in the lay press, the public rails against wellness — or “bullies” the wellness industry, to use the term that the Ignorati use for people who disagree with them publicly. You don’t have to look far—just back to HuffPost on Wednesday. Or All Things Considered. The news flash is that this whole business of “making employees happy whether they like it or not,” as we say in Surviving Workplace Wellness is now acknowledged – by the Ignorati as a group — to be a charade. HERO seems to have exhausted their integrity quota pretty quickly, because after that welcome and long-overdue and delightfully shocking admission, they slip back into character. To get good answers, you must ask good questions. We do. 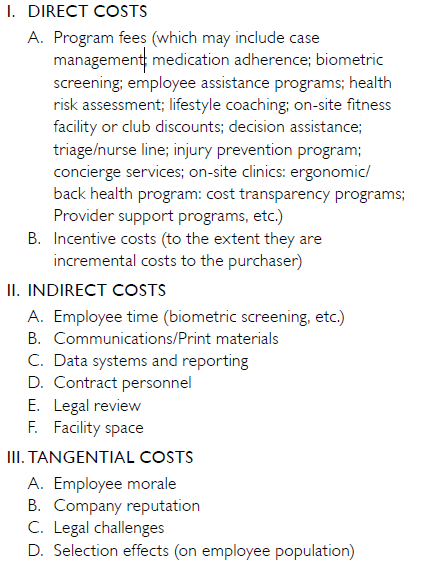 Specifically, in their listing of costs, they conveniently forgot a bunch of direct, indirect and “tangential” costs. Like consulting fees. Generally, the less competent and/or honest the consultants, the more they charge. (For instance, we can run an RFP for $40,000 or less, and measure outcomes for $15,000 or less — and do both to the standards of the esteemed and independent GE-Intel Validation Institute. Most other consultants can’t match either the price or the outcome.) We’re not calling any consulting firm incompetent or dishonest other than pointing to a few examples that speak for themselves, but it does seem more than coincidental that the consultants involved in this report have conveniently forgotten to include their own fees as a cost. And what about the costs of overdiagnosis caused by overscreening far in excess of US Preventive Services Task Force guidelines? The cost of going to the doctor when you aren’t sick, against the overwhelming advice of the research community? Still, we need to give credit where credit is due, so we must thank the Ignorati for acknowledging that wellness harms morale. It took even less time for this acknowledgement than for the tobacco companies to admit that smoking causes cancer. By whynobodybelievesthenumbers in Uncategorized, Wellness, wellness doesn't work on March 13, 2015 . Al, I think you may have missed an addition al point: Item D, Selection effects (on employee population). Might this mean that some good employees will actually leave, and others will avoid coming to avoid intrusive, coercive, do-to rather than do-for programs? I hadn’t understood Item D. Thanks for pointing this out. It’s not clear to put it mildly, but your interpretation is as good as any. The prospect of being pried, poke and prodded is not exactly front-and-center in most recruiting efforts. Hilarious! As soon as I saw the title of this article, I knew Al Lewis had written it. Nice try, Al, but your propaganda is failing. so you’re saying I hacked into their computer system and wrote the lists of costs on page 10? LOL — no wonder you call them the ignorati. This guy Elsass is looking right at the screen shot but still denying its existence. Nice! I tried to get an answer out of Dr. Steven Aldana during a webinar today, but there was no response given from him or his assistant after I gave the link to that HERO report. Aldana is not much for answering hard questions. When he did his webinar comparing me to a tobacco executive lying to Congress, a number of people told me they submitted questions but Aldana’s waterboy, Troy Adams, didn’t queue them up. And remember, the strategy of the Wellness Ignorati is to ignore facts. This report is a fact. Ergo, they will ignore it even though they themselves created it. In the poll, where people vote for what they’re response is going to be, ignoring this posting is winning. Now you see why. Thanks again for commenting, for trying…and for proving our point. Hey Mr Transparency, you forgot to link to the report you insist you want us all to read. Yeah, I know, they don’t link to you or even mention your tremendous contributions to outcomes measurement but you’re the “good guys” here. Set the example. You may want to add the date to future posts. Having the date on the comments doesn’t tell you when the post first appeared. A nitpick, but it helps readers evaluate the post. you mean at the beginning of the comments, a note that this post appeared on such-and-such date. The posts can be long so people don’t have to scroll way back up? If that’s not what you had in mind write privately. Thanks! I guess you aren’t “bullying” a group of people here but you are certainly calling them a name from the very first sentence and 10 times thereafter. To call a group of people ignorant is certainly an acceptable criticism, but to continually do it under a made-up derogatory term makes it difficult to continue reading as you know what you are reading is juvenile in structure and completely biased in nature. Perhaps I take healthcare too seriously. Alas, unenthusiastically I continued to read your article. Your argument or “self-immolation” is amazingly out of context. You say, “We were shocked by the revelation that the Ignorati actually realize that employee morale and a company’s reputation both suffer when companies institute wellness programs – but here is the screenshot.” Wow! That screenshot in no way reflects what you purport it to say!! Had you given your readers context, they would have known that all that screenshot is representing are expenses attributed to the outcomes they are measuring. They are being rolled up into the numerator of a formula to determine Value On Investment (VOI). Outcomes are being rolled up into a denominator. They are called “Tangential” because these costs are not entirely attributed to one outcome or another, i.e. not every cent of every dollar spent on advertising can be said to effect morale which effects productivity, but some portion does. The definition of tangential information is “merely touching; slightly connected.” That screenshot is in no way saying that a wellness program causes those things to suffer; it’s literally attributing spend on tangential items to the outcomes it is measuring. Thank you for your comment. Someone being a memenbr of the “Wellness Ignorati” in no way reflects that they are ignorant. It is quite the opposite: The definition, from Cracking Health Costs, is that they deliberately ignore the existence of inconvenient facts. It’s a brilliant strategy and I have great respect for their ability to stick to it. For instance, 87 pages without a mention that two people — who have gotten more exposure in the lay press, published more widely read articles in high-impact journals/academic blogs and sold more books than all of them combined –disagree and “here’s why they are wrong.” That would require acknowledging our existence, which in turn might bring people to the site to see for themselves. So, no, just for the record, these folks are far from ignorant. As for the context, I invite people to look at the context and see for themselves, and compare your viewpoint to ours of whther they view morale as a cost. Ironically right this second, I am writing this from Penn State University, where I am an honored guest of the faculty senate, and where the morale hit from the misguided program that Ron Goetzel and Highmark tried to execute 18 months ago still lingers. As you can see from the fact that we printed your comment, we are big believers in transparency, dissent and especially debate. But literally every time we try to debate someone they either refuse (Ron Goetzel) or lose and don’t allow the recording to be made public. (Michael O’Donnell). It is amazing that 1) people actually make these comments without having even read the darn thing, 2) others deny what is said or put a wild spin on it – even when it is said – and 3) in the case of “wellness or else” approaches they also have failed to read the last 30 years of literature that conclusively show that these kinds of tactics don’t save money and engender all kinds of iatrogenic consequences that are never measured and usually not even mentioned.